The afternoon started amiably enough. I was at my father’s house, meeting his old friend for the first time. The friend, like my dad, is in his late sixties, and is not a thin man. We’d been getting to know one another, making small talk about his travels and my work. I’d been talking about my day job when my dad jumped in. “She’s been writing, too,” he prompted, proudly. When his friend asked what I wrote about, I said my writing focuses on how fat people are treated. “I hope you’re talking about portion sizes,” he offered up. “Do you mean what it’s like to be lazy? Americans are so lazy,” he said, voiceviscous with judgement. “So you’re telling people a lie,” he stated simply, lightly, leaning back in his chair. “Are you comfortable with the lie you’re selling?” he asked coolly, waiting for a response to rip apart. He, a coyote. Me, his carrion. My head flooded with responses. I’m not selling anything, I write because I love it. That wasn’t the point. Are you my psychologist? Too confrontational. Why would you call your friend’s daughter a liar? Unfair to pull my father into a conversation he hadn’t asked for. Why is my happiness so unfathomable to you?But that would lead us further down this road. He’d already shown his hand, already bared his teeth. He wouldn’t believe what I had to say about my life in my own body. He felt at home in my father’s discomfort and in my disquiet. My father sat, slack jawed and quiet, blindsided by such an unexpectedexchange. He was speechless, watching it all, loyalties divided between friend and family. He’d planned such a lovely morning, and suddenly the air wasdense with tension. I changed the subject. We moved on. I have learned to spot people like my father’s friend, and have learned when to walk away. But those moments stay with me, burrow beneath my skin, nest at the nape of my neck. As I drove home, my breath fell into the bottomless pit of my lungs, unable torevive me. The base of my skull buzzed and pulsed with anger. I was sofrustrated and so exhausted. To him, my account of my own life wasuntrustworthy, impossible, laughable. I was naive and ridiculous in my youth, believing anything to be possible. Even my own dignity. Even my own happiness. Moments like these happen so often. In more benign exchanges,acquaintances show me that I cannot be trusted with my own experience. In more pronounced moments, my autonomy is laughable, openly ridiculed, a plaything to be torn apart for sport. So many strangers, it seems, arescavengers. Being called a liar — openly — has become a regular feature of my life as a fat person. Any answer I offer about my body, the food I eat, the way I feel, or the regularity with which I move is answered with a dismissal. When asked if I exercise, I say yes. No you don’t or Is it aerobic? it needs to be aerobic echoes back. Have you tried South Beach? is met with you probably did it wrong. When asked if I’ve engaged a nutritionist or trainer, I say yes, for several years. You probably didn’t stick to it long enough. It just takes a little willpower! These questions — about diet, exercise, worth and will — have no answers that will satisfy their askers. My words have already been betrayed by the believed brokenness of my body, and the flawed character that created it. There is nothing I can say to counter the assumptions attached to my wide, soft frame.Coworkers and strangers offer up unsolicited advice for how to change the body I have always had, then chase it with judgment and dismissal, a scriptedresponse, delivered as if I had not spoken at all. To many, my body is the subject of a boring kind of science, a rote experiment with no new findings, just confirming old results. My body is vivisected just to see how it works, twitching and alive and cut apart to locate the physical source of its failure. My experiences cannot be trusted — they must be wrestedfrom my body, a tidy fillet cut from an unsightly beast. But their unskilled, uncaring hands cannot dissect something living and leave it alive. They do not believe themselves to be dismantling my body, and their eagerness isn’t borne of pure judgment or dismissal. They are not trying to hurt me. They are chasing a deep desire to make sense of their own unrulybodies, and of the shame we’ve all been taught to feel about the shape of our skin. If they can figure out where I have failed, what has led me to the terrible fate of the body I have, they can avoid that destiny themselves. And they can rest assured that they are the experts, the virtuous, the strong and wily who were able to outwit their own bodies. They are terrified of what their bodies will become. Acquaintances’ questions of me aren’t questions, but prayers for strength andvirtue. They believe that my flaws have become physical, that temptationlurks everywhere, and their strength and smarts will save them from a body like mine. Because they believe that bodies like mine only give way to misery, isolation, hurt and heartbreak. Only the pure of heart and will can escape that fate. They’ve been told everywhere that one false step will lead to having my body. To them, my body isn’t my body — it’s a symbol of their fate. So of course my experience isn’t my own. When a fat person breaks that chain — claims their own happiness, becomes an Olympic medalist, tries everything to lose weight and only seems to gain it back — the world must regain order. Happy fat people, fit fat people, fat people who have taken a cue from years of failed weight loss attempts — we all become outliers, inconvenient points on a messy scatterplot that once felt like such a tidy curve. We are so often told that our bodies are skeleton keys, thepanacea to any sadness or melancholy that might sink into the empty spaces in our lives. Weight loss becomes a tonic — drink it, and you’ll have everything you want: the life, the partner, the family, the job, the beauty, the strength.Drink at and get free. When I told my father’s friend that I could be happy now, all of that was thrustinto the light. 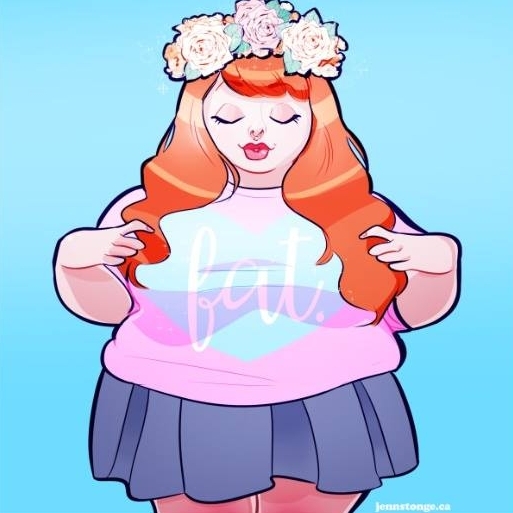 If I could be happy at a size 26, then anyone’s happiness might be more complex than the size of their clothing. If I can be happy now, maybe he could, too. And that might mean tackling an unfulfilling relationship, digging deep into the recesses of the parts of himself he doesn’t like. It might mean that pouring all of his sadness into ruthless exercise regimens and flash-in-the-pan diets doesn’t make as much sense as it used to. Our bodies have given structure to our sadness. But sadness is wily, fluid, finds its way into unexpected places. And happiness isn’t monolithic, nor is it a point of arrival, a place to stay. Our lives are notstasis, not carefully groomed worlds in suspended animation. We move forward, clumsily. We make mistakes, and we work hard to do better the next time. We lose relationships. We lose loved ones. Sometimes we fail; sometimes succeed. But we keep working hard in our messy circumstance. A body won’t change the tangled nature of our gorgeous, inconvenient lives. I am an upbeat, heartfelt, engaged, enthusiastic person. I love my work, my friends, my family, my life. I have sad moments, sometimes about the way my body is treated, and more often about deeper uncertainties about my life and the world around me. But that is a deeply unsatisfying answer for theacquaintances, coworkers and strangers who rely on bodies to make sense of their lives and relationships, a shorthand for character and a glyph of success or failure. So little about our lives is simple, and it is tempting to believe that a new or different body could bring order to an unstable world, to slipperyrelationships and doubts about ourselves. We are all more complex than our bodies. We are more expansive, more potent, more real and messy than the shape of our skin. Yes, I believe I can be happy as I am. Yes, I believe you can, too. But mostly, I just wish you believed me.